It is a regrettable reality of human nature that witnessing the suffering and anguish of particular individuals can be a source of entertainment for the rest of us. Making fun of mental illness has a long history that unfortunately continues to the present day. This was highlighted in the past week in the reporting of plans of the Royal Agricultural Society of WA to offer an amusement at this year’s Perth Royal Show based on the notorious Bethlem Sanatorium in London, commonly known as Bedlam. 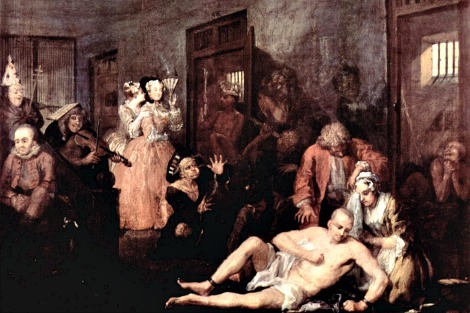 Bethlem was known for its cruel treatment of mental illness patients as far back as the 13th century. Today it provides specialist care for more than 450,000 sufferers a year, and seeks to avoid the deliberate stigmatisation that was for so long part of its method of operation. The Perth Show attraction was to feature actors posing as disturbed psychiatric patients from centuries ago, when they were displayed as a public spectacle. The chief executive of the trust that runs Bethlem, Dr Matthew Patrick, said in an open letter that the attraction would ‘foster discrimination and promote the perception of “scary mental health patients” which [would] undoubtedly deter people from seeking the help they need’. The Agricultural Society has responded to the criticism by merely modifying the attraction, removing all references to mental health. However it remains to be seen whether the revised theme of ‘the outbreak of a deadly contagion’ represents much of an improvement. Judging from what we know, it is still a something of a freak show, stigmatising individuals and making fun of their suffering. If we ask ourselves how we should approach contagion, we might urge the physical isolation of those carrying the ebola virus, for example. But not their stigmatisation. The plight of these humans is certainly not a subject for amusement. The Agricultural Society of WA has been around since 1831 and is apparently a respected and influential institution within the community. Its chief executive Peter Cooper claims the Show is ‘the most important community event in the State’. But his limp response to the Bethlem attraction controversy suggests the Society was more interested in appeasing critics than exercising leadership by fostering responsible social attitudes. It could have owned the criticism and made a positive statement about understanding mental illness and how to deal with it. But instead the statement merely said the Society did not want to cause offence. Civilisation is, after all, only a thin veneer. Thank you Father Mullins, Jack Heath, Frank Quinlan and Dr Patrick for your assessments of such a project. The idea illustrates that our supposed ethical maturity regarding mental and physical illness in the last 500 years is no more than a facade for some people. Keep up the great fight against stigmatism, SANE. It is sad that people are so fragile that denigrating others can be an enjoyable pastime. People are so quick to laugh and partake without any thought of respect or responsibility. The medical/psychiatric profession should look at their own treatment of so called "mental patients" who they sometimes stigmatise with their arbitrary diagnoses and medicating them in a a way that causes more suffering to them than the original "condition" - maybe just so that their carers/family/co-workers (society) doesn't have to tolerate their energy, creativity and harmless rants. It seems that entertainment can encompass any subject these days, so the show organisers just want bottoms on seats as the saying goes. While not such a personal subject as mental health, war is constantly being presented as entertainment in TV on a constant basis, so much that one could be mistaken into thinking that war must be glorified to condition people into a readiness to send our men out to die in another conflict, whether right or wrong.